Retina MacBook Pro to get slimmer with Intel Haswell chips at WWDC? 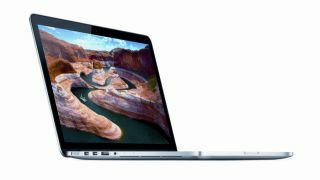 The 13-inch MacBook Pro with Retina Display laptop could get a new slimmer profile if it is refreshed at WWDC 2013 on June 10, according to one analyst. The relatively reliable (at least for an analyst) Ming-Chi Kuo of KGI Securities, said Apple will introduce a more streamlined design and upgrade the camera to full HD with its keynote address, a week from Monday. According to recent reports, the tweaks will likely join the addition of Intel's new low-power, high performance Haswell processors, which were officially launched this weekend. In a research note to investors Kuo wrote: "We expect the 13" Retina MacBook Pro will have a slightly slimmer form factor for increasing its portability. "Also, we think the camera spec will be upgraded from HD to full HD. This will improve Facetime and video conference quality in the high resolution Retina display." Beyond new Retina MacBooks Kuo also said Apple is planning a refresh for the popular MacBook Air model. He told investors the ultra-portable notebook would be getting a dual-microphone to enable better FaceTime and VoIP call quality. Naturally, it would seem, Haswell processors would be included within that model also, but there's been no recent word on a potential Retina Display.